Mainly it was the letter behind Heitkamp’s name that was a provocation. Cramer had no record, so he relied on the letter “T” for smirk material, as his adopted Proud Boy hefty hefty hefty bag of cruel idiocy ran his mouth over the edge of the rally mob cliff. Kevin clung to Trump like a jittery infant spider monkey. It should be a red flag. If a criminal huckster is your ace in the hole, you don’t have a lot of self-respect, self-awareness or self-control. But Donnie has the same base as Cramer, so Kevin followed DT on the low road next to a high wall like a loyal parrot. If Trump ran a lie-riddled slimy racist terror campaign, so did Kevin. One Hundred percent. He admits it. Every juicy glob of fearbasing the caravan of strollers dripped right on Kevin’s head. Every wild-eyed lie rained down like oil money. Some pundits are trying to blame Heidi’s loss on her Brett Kavanaugh vote. Maybe, but I doubt it. Thousands of spare white conservative judges, just like Kavanaugh, are kept in a Federalist Society humidity controlled warehouse with Schlitz malt liquor on tap. Nobody would miss Brett. Send up Chad. Could the conservative groups have directed Trump to pick someone without rabies and fewer assaults? Yes. But noooo. The Republicans had to have Brett. He was special to them for some reason — their precious — but few people in the reality-based mainstream, or lesser streams, would be able to discern the difference between BK and the next prep school college legacy freshman. But Trump got Cramer’s base wound up and they bought DT’s dribble. The red hats seem to like being lied to. He mocked Dr. Blasey Ford and called her a liar. Good enough for the gullible. Most wouldn’t know the difference between a solid, well-qualified judge/good person and a plate of cottage cheese. Plus loudmouths in the Cult45 North Dakota branch couldn’t understand that Kavanaugh was actually made a Supreme, so Heitkamp’s vote didn’t change the result, and she wasn’t even on the judicial committee. Why would the disposition-impaired and lying East Coast-indoctrinated Kavanaugh matter that much to the average jamoke? Maybe a few hardcores who wouldn’t have voted for Heidi under duress, but not Larry next door. Cramer thinks that Heidi’s record was the decider. Doubtful. But his plan to not have a record worked out fine for him. 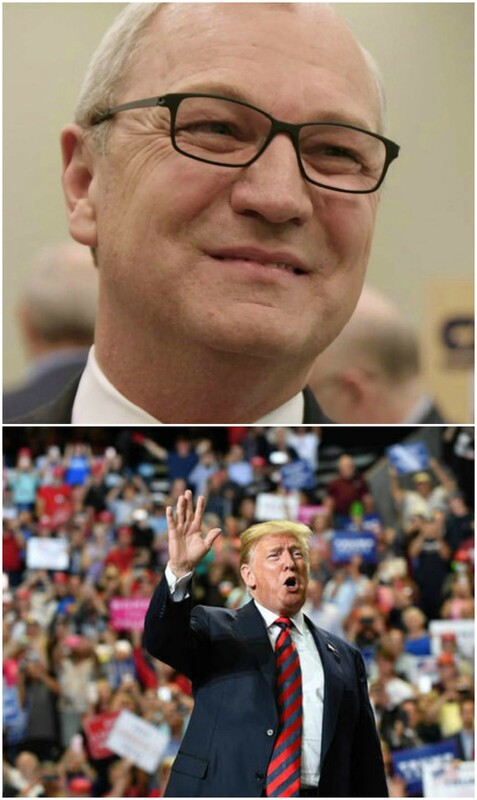 Gosh, where has Kevin Cramer’s good fortune come from? Was it trickery? North Dakota was gerrymandered to benefit Cramer, that’s for sure. It’s crawling with mad red hatters who believe every lie that Trump and Trump Lite spit out. Was it because Cramer supported the farm-killing tariffs, the budget-busting tax scam for the rich and people killing health care? Did Cramer get points for defending Trump’s cruel separation of children from their parents, 45’s jellylike kneeling before Vladimir Putin or Don’s mocking of a sexual assault victim? Sidebar: Cramer and his assortment of surrogates said that Dr. Ford didn’t have corroboration for her claims, but these failed media types didn’t need evidence from the women who accidentally ended up on Heidi’s now-famous list of sexual assault victims in order to savage Heitkamp. Cramer and the boys suddenly became fluid on the corroboration thing. They believed whoever gave them scandal material, but not Ford. Heidi believed all of the women. Maybe this is it. Cramer has President Donald Trump’s ear, or so Kevin’s boastful story goes. Not Van Gogh style, though. Evidently, Kevin thinks that talking into Don’s ear will have some effect on the raging bull’s brain when shouting into a gopher hole will at least irritate a rodent. Most people don’t know this, but if you put your ear next to Trump’s you can hear a meadowlark in the distance. It’s adorable that Cramer thinks that Trump will change his speed, direction or incompetence for anyone. If Kevin was paying attention, he would have heard that thunder thighs doesn’t listen to anyone in the band. So where is the deal? Was it Cramer’s overabundance of modesty that tipped the scales in his favor? Especially for such a big fish like him, as he explains. Probably not. Trump had an approval rating of 55 in North Dakota according to the latest Morning Consult poll released on Nov. 5. It had a 3 percent margin of error, as did the same poll a month earlier when the state gave Trump a 52 percent approval. Based on these two polls and the 3-point margin, one could surmise that Trump’s approval in early October could have actually been 49 percent and truly 58 percent just before the election. You mean besides hundreds of huge lies about most everything? And Trump ignoring the right-wing terrorism. Actual shooting and bombs in the mail. Even after Kevin Cramer, stressed the need for civility in Washington, Cujo didn’t heed Kevin? After Trump quit messing around with everyday racism and went nuclear on the caravan, the misnamed sanctuary cities and the “invasion.” Troops were called in. Don called for the end of birthright citizenship, which really got the white nationalists swooning. Cramer played the white identity strategy 17 percent less repugnantly than POTUS, but he was a recipient of DT’s wildman’s flurry of racial resentment and victimization and Kevin knew. Here is just a small sample of Trump’s falsehoods and be-scared-of-the-brown-man tactics. I was and now am worried what Cramer has to say as a senator for the next six years. But after seeing him stand there and look like a smirking goon with the new R senators with the Sen. Leader. Even when he doesn’t say anything he makes ND look bad. OMG it is going to be a long six years!